15/09/14 - A moderate expansion is underway in most major advanced and emerging economies, but growth remains weak in the euro area, which runs the risk of prolonged stagnation if further steps are not taken to boost demand, according to the OECD’s latest Interim Economic Assessment. While the global recovery continues at a moderate rate, the outlook is uneven across regions. Growth will be strong enough to push unemployment down further in the United States, the United Kingdom and Canada. In Japan, where unemployment has already declined to low levels, the economy will grow broadly in line with its potential. China is expected to continue an orderly adjustment to still high but more sustainable growth rates. Growth in India is projected to pick up and Brazil will experience a modest rebound from recession. The OECD projects that the US will grow by 2.1 per cent this year and by 3.1 per cent in 2015, while the UK is projected to grow at 3.1 per cent in 2014 and 2.8 per cent in 2015. Canadian growth is projected at 2.3 per cent this year and 2.7 per cent in 2015. 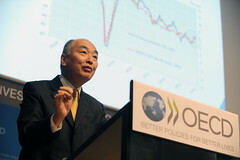 Under the continuing influence of monetary stimulation, Japan is projected to grow by 0.9 percent in 2014 and 1.1 percent in 2015. The euro area is projected to grow at a 0.8 percent rate in 2014 and a 1.1 percent pace in 2015. Growth prospects differ widely among the major euro area economies. Germany is forecast to grow by 1.5 per cent in both 2014 and 2015, France by 0.4 per cent in 2014 and 1 per cent in 2015, while Italy will see a -0.4 per cent drop in 2014 and a gain of just 0.1 per cent in 2015. Given the low-growth outlook and the risk that demand could be further sapped if inflation remains near zero,or even turns negative, the OECD recommends more monetary support for the euro area. Recent actions by the European Central Bank are welcome, but further measures, including quantitative easing, are warranted. Given the weakness of demand, European countries should also use the full degree of flexibility available within the EU’s fiscal rules. While emerging economies as a group will continue to grow much faster than the advanced economies, the forecasts are similarly uneven across countries. China is expected to grow by 7.4 per cent in 2014 and 7.3 per cent in 2015. India will grow by 5.7 per cent in 2014 and 5.9 per cent in 2015. Brazil will grow by only 0.3 per cent this year, having fallen into recession in the first half of the year, and 1.4 per cent next.